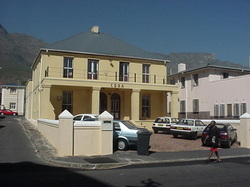 We live at 52/54 Francis Street, Woodstock, Cape Town, just a few minutes drive from the city centre - this is a picture of our building. By car from the City Centre: get onto the N2/Eastern Boulevard from town (the highway to the airport) and take the 1st exit at Searle Street. Go down Searle Street and turn left into Francis Street before you get to the traffic lights on Main Road (also called Sir Lowry). CDRA is 150 metres down on the left. A yellow double-story with a grey roof. By car from the airport, the Cape Flats or the Southern Suburbs: Get onto the N2/Eastern Boulevard going west into the City Centre. Take the last exit left - Searle Street - before you reach the city centre - loop back down under the highway and turn right into Searle Street, towards the sea. Go down Searle Street for 3 blocks and turn left into Francis Street, just before you get to the traffic lights on Main Road. CDRA is 150 metres down on the left. A yellow double-story with a grey roof. By minibus taxi along Main Road (also called Sir Lowry): Stop at the traffic lights at the corner of Main and Searle Street. Go up Searle Street and take the first turn to the right into Francis street. CDRA is 150 metres down on the left. A yellow double-story with a grey roof.